The effects of climate change on the ocean are extensive ― sea level rise, ocean acidification and the ocean’s changing influence on local weather patterns ― and affect more than just nature, continually impacting many facets of daily life. San Francisco State University has been a leader in the study of marine and estuarine ecosystems since 1978, when it established the Romberg Tiburon Center for Environmental Studies. Now the University is launching a new research and service organization at the Romberg Tiburon Campus — the Estuary & Ocean Science (EOS) Center — representing the first and only institution of higher education with a marine science laboratory dedicated to research and scholarship located on San Francisco Bay. The Center also serves as a gateway for students and community members to learn about coastal ecosystems. In fall 2017, faculty affiliated with the EOS Center admitted the first cohort of 12 graduate students to RIPTIDES, a graduate training program that eschews traditional disciplines and is supported by a National Science Foundation Research Traineeship grant. Students in RIPTIDES will instead earn a master’s degree in interdisciplinary marine and estuarine sciences. “We want our students to think about big problems in the ocean and estuary from lots of different perspectives,” said Stillman, who helped launch the program. During the first semester, students explore complex environmental problems as case studies, then work in teams to solve various aspects of the problem while considering it in its full complexity. “The questions are usually more about how to manage the issue. Finding a solution that fully resolves the problem isn’t always possible,” said Cheryl Patel, a student in the first RIPTIDES cohort. During the spring semester, as students progress through the master’s program, they identify topics and begin their research projects, aided by at least two mentor-professors. During the fall, they begin internships designed with an eye toward practical experience with Bay Area organizations such as the Bay Conservation and Development Commission, the Exploratorium and the National Estuarine Research Reserve. 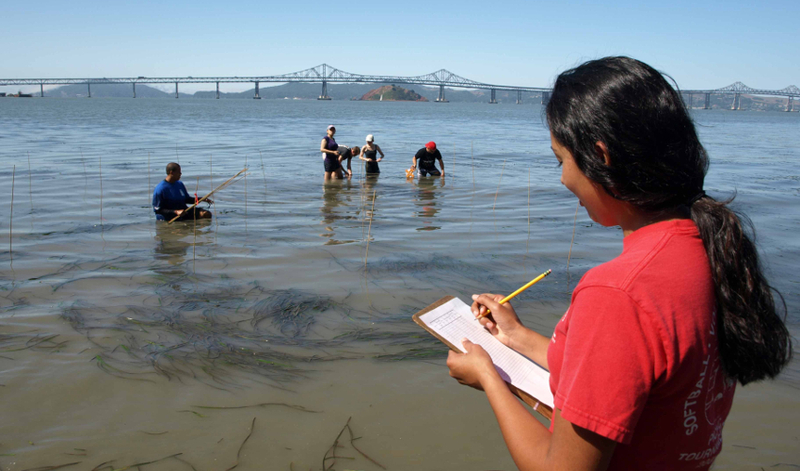 Students are already benefiting from the EOS Center’s unique location on the San Francisco Bay. “You have the estuary and the open ocean, protected areas and private lands nearby,” explained Chelsey Wegener, a RIPTIDES student. Ultimately, RIPTIDES will prepare graduates for careers around San Francisco Bay and beyond with the tools to manage complex environmental problems from a variety of angles. For more information about the Estuary & Ocean Science Center, visit eoscenter.sfsu.edu.